Excited Pilgrims Arrive in Galilee to Start the Trip of a Lifetime! Even though the El Al flight was a bit late they all arrived safely and in great spirits ready for an amazing pilgrimage through the Holy Land — and we are here to insure they are not disappointed :-) Enjoy the movie! Recalling these words of Jesus, the Catholic Church professes that, in the celebration of the Eucharist, bread and wine become the Body and Blood of Jesus Christ through the power of the Holy Spirit and the instrumentality of the priest. Jesus said: “I am the living bread that came down from heaven; whoever eats this bread will live forever; and the bread that I will give is my flesh for the life of the world. . . . For my flesh is true food, and my blood is true drink” (Jn 6:51-55). The whole Christ is truly present, body, blood, soul, and divinity, under the appearances of bread and wine—the glorified Christ who rose from the dead after dying for our sins. This is what the Church means when she speaks of the “Real Presence” of Christ in the Eucharist. This presence of Christ in the Eucharist is called “real” not to exclude other types of his presence as if they could not be understood as real (cf. Catechism, no. 1374). The risen Christ is present to his Church in many ways, but most especially through the sacrament of his Body and Blood. What does it mean that Jesus Christ is present in the Eucharist under the appearances of bread and wine? How does this happen? The presence of the risen Christ in the Eucharist is an inexhaustible mystery that the Church can never fully explain in words. We must remember that the triune God is the creator of all that exists and has the power to do more than we can possibly imagine. As St. Ambrose said: “If the word of the Lord Jesus is so powerful as to bring into existence things which were not, then a fortiori those things which already exist can be changed into something else” (De Sacramentis, IV, 5-16). God created the world in order to share his life with persons who are not God. This great plan of salvation reveals a wisdom that surpasses our understanding. But we are not left in ignorance: for out of his love for us, God reveals his truth to us in ways that we can understand through the gift of faith and the grace of the Holy Spirit dwelling in us. We are thus enabled to understand at least in some measure what would otherwise remain unknown to us, though we can never completely comprehend the mystery of God. More than anything else the Eucharist is what is missing in the Protestant faith. That is the primary reason I will become a Catholic this Easter. But there is so much more that is lacking in the Protestant Sunday worship. The entire Mass at every Catholic Church is in preparation of receiving Christ’s body and blood. It is also a true worship service for and to our God. This is the church Christ built, not one made by man, who waters down the truth to fit their own ideas. Another reason is his Mother Mary, who Protestants only bring out at Christmas. Mary is the Mother of our Lord Jesus Christ, Son of God, you don’t think she deserves to be appreciated, and shown respect for who she is, and what she took upon herself as the Mother of the Son of God. This I do not understand? Mary is the Ark of the New Covenant. Pure, born with out original sin, that is why she was and is the Immaculate Conception the doctrine that God preserved the Virgin Mary from the taint of original sin from the moment she was conceived; it was defined as a dogma of the Roman Catholic Church in 1854. Her life is worthy of our love as the Holy Mother of God. Her son loved his mother dearly, she is the Queen of Heaven, that St. John writes about in Revelations. While still on the cross before he breathed his last breath, Jesus Christ made certain his mother would be taken care of after he left this earth. He gave her to his beloved Apostle St. John. This too tells us that she had no other children to take care of her, but Jesus Christ alone her only begotten Son. That is why he left her in the care of St. John. My third reason for being a Catholic. I have had for many, many years at times seen visions in my minds eye. They always happen in the early morning hours before rising. Have always thought they were glimpses of heaven, because of the bright light and things that I see going on. One morning last year I had a vision that went on, and on for two hours. That had never ever happened before, nor has it since. These visions normally only last a few minutes, or seconds. This time I saw white tables (later realizing they were altars) with gold candle sticks, gold and white was everywhere, along with throngs of people. I knew this had to be something important, because it went on for such a very long time, but what was it??? I truly did not understand the meaning, only that it must be extremely important. That morning when I went upstairs, turned on EWTN, there was my vision, it was Pope Francis’ inauguration. I looked at the TV and said out loud, “I’m suppose to be a Catholic!” that was my vision on TV. WOW it shocked me, I don’t know if you can really grasp what a powerful statement that was for me that morning!!! There it was, my vision on live TV. The vision that I saw for over 2 hours, was all about Pope Francis’ inauguration. What else could I draw from that vision, only that I was meant to be a Catholic. I had never sought to make this change, my heart had been prepared, I was open to hearing and seeing the truth unfold before my eyes, the Holy Spirit was guiding my journey to the Catholic Church. I didn’t immediately go to Saint Bernard’s in Eureka, but did keep listening to Catholic Radio daily. I was still the head of our Hospitality committee at New Heart, our church, as well as attending a ladies bible study group once a week. My committee was extremely important to me, I was vigilant in making all who came feel welcomed. My pantry is filled with supplies I had purchased to make them feel this is where they belonged. Every month when I was the one serving it was done as if we were celebrating something special. For me it was all about Christ. Another reason that I didn’t immediately go off to Saint Bernard’s, was my Baptist faith. You know yourself all too well I was led to you and Jeannine, God had led me to you, to become a member of your church, after the miraculous healing of Matthew. I could not understand why God led me to you then, and now was leading me to the Catholic church. It was confusing. Then one Sunday at our Church, it was the Sunday that we have communion, we only have it once a month, my pastor held up the cracker then he said these words, “there is nothing mystical about this cracker”. That statement pierced my heart. Thinking to myself there must be more to this, otherwise why are we doing it. That statement really made me want to see what the Catholic church had to offer. Why had God given me that vision, unless he wanted me to be Catholic? Watching the Mass on EWTN does not really convey what is happening unless you understand it already. So on May 5, 2013 I went to my very first Mass at Saint Bernard’s in Eureka. I’d been to Weddings and Funerals at different times in my life, never a Sunday Mass. Fr. Eric Freed was their priest. He won me over that day. The Mass and Fr Eric were the catalyst, that confirmed this is where I belong, I knew I was home. I have not missed a Mass since that Sunday. When I shared these things with Fr. Coddaire he said, you aren’t changing religions just the way of worship. I did not plan this change, it had to be the Holy Spirit leading me to Christ’s church the one he built. Not one that was built by men. I know you feel all of their traditions are unnecessary, and are not scriptural. That all one needs are the scriptures and nothing else. But Christ never said, write a book, and that will be my church. He never told them to remove 7 books from the Old Testament, claiming they were not divinely inspired. No Christ built the church and Peter was her first Vicar. Have you ever read those 7 books? I have, believe me they are obviously divinely inspired, here is an example. Sirach 15:15-20 15 If you choose, you will keep the commandments and so be faithful to his will.16 He has set fire and water before you; put out your hand to whichever you prefer.17 A human being has life and death before him; whichever he prefers will be given him.18 For vast is the wisdom of the Lord; he is almighty and all-seeing.19 His eyes are on those who fear him, he notes every human action.20 He never commanded anyone to be godless, he has given no one permission to sin. http://www.catholic.com/tracts/the-old-testament-canon Primarily these books were dropped because of their doctrinal reasons by the Protestants, during the reformation period. Think about this, those 7 books were are part of the Septuagint, they were the writings in the Old Testament, that Christ quoted from daily. He never said get rid of those books. So why were they removed, because they held stumbling blocks that Protestants did not want to follow? Truthfully must confess, I always felt something was missing every Sunday, for the past 40 years. I never felt that true connection between us and Christ when we had communion, that was because it wasn’t the Eucharist. Why did Christ set up this practice, if there isn’t anything “mystical about the cracker?” Remember these words Jesus said, long before the Last Supper. In John 6: 53 Jesus replied to them: In all truth I tell you, if you do not eat the flesh of the Son of man and drink his blood, you have no life in you. 54 Anyone who does eat my flesh and drink my blood has eternal life, and I shall raise that person up on the last day.55 For my flesh is real food and my blood is real drink.56 Whoever eats my flesh and drinks my blood lives in me and I live in that person.57 As the living Father sent me and I draw life from the Father, so whoever eats me will also draw life from me.58 This is the bread which has come down from heaven; it is not like the bread our ancestors ate: they are dead, but anyone who eats this bread will live for ever. I have never felt more closer to Christ than being in a Catholic Mass, the entire culmination of the Mass is seeing all the followers of Christ receiving his body and blood, with so much reverence for what it is. Not just a cracker, but the true body and blood that Christ said we are to eat, so that we may draw life from him living in us. In the Catholic church there is more love for all of his children, especially the little ones, as well as the adoration of our Savior, more than anyone can ever fathom. Fr. Eric would always speak about how he loved to see and hear the little ones in our worship services. All the small toddlers running and toddling down the aisles as fast as they can go, followed by their mother or father. What joy that brings, seeing these precious gifts from God. It’s just wonderful. If you have watched on the news, or are aware of the tortured murder of a Priest in Eureka, CA on January 1, 2014, that was Fr. Eric, may he rest in peace, my Parish Priest. Our grief cannot be measured. Every Thursday night since I decided to take the path to becoming a Catholic I attended meetings in the Rectory. I saw Fr. Eric every Thursday at RCIA meetings, and Sunday Mass up to the day of his murder. It has been extremely painful for all of us. He lived his faith. He won me over that first Sunday in May. I shall be forever grateful to him, for who he was, his memory will be with me forever. It should be Fr. Eric there for my Confirmation, and First Communion. I know he will be with us in his Spirit. Fr. Eric grew up in Covina, CA. He was in High School at Northview High when we lived on Delay. When he realized this we knew we had our own special bond together. This is my journey to the Catholic faith, and why the Protestant faith falls short in giving me a fulfilling relationship with our Lord and Savior Jesus Christ. I have felt the love of God, and his people’s love for him at every Mass I have attended. I go alone, yet inside the church no one is alone, or feels alone. God’s people living and loving one another, worshiping our Lord and Savior. There is nothing to compare how transforming every Sunday is, and has been since that very first Sunday on May 5, 2012. I challenge you to spend time listening to Catholic radio with an open mind. Visit Catholic. org, or Catholic.com for answers to your disbelief. I can imagine your thoughts right now, like right me listening to Catholic Radio, that will never happen. You too might find yourself on a different path to becoming the Christian you seek to be, to increase your relationship with Christ. It truly will teach you more truths that you have not known about Jesus and his church. Every day is a new revelation from God. Remember the “truth shall set you free”. John 8: 31-32 “To the Jews who believed in him Jesus said: If you make my word your home you will indeed be my disciples; 32 you will come to know the truth, and the truth will set you free. I am bringing it up because, while it is true she was demon possessed, and well documented, no one from the several different Protestant denominations who visited her could free her from the powers of this demon. All who had visited her, left in freight of what they saw. The reporter said, “when the Parish Priest walked into the room she told her she saw Jesus Christ, not the Priest.” The power of Jesus is with those who are called to be his Priests on earth. It is the “power from Christ” given to his priests, that allowed this particular priest to be able to free that poor woman from the demon that possessed her. I’ve come to realize those 40 years, which it was precisely when I went to my first Mass, where for me to grow in loving God’s word. When I started reading the Old Testament, the Hebrew Scriptures as Fr. Eric called them, in studying them I came to understand how God’s temple, and his Priest were extremely important to him. Seeing how many times he reprimanded the Israelites for allowing his temple to fall into disrepair. Worship of our God is an important element of our commitment to him. It was in the first century when Christ built his church, and remains the same today in 2014 in the Catholic Church. That is my story. All of these scriptures, and many lifetime experiences are why I now know beyond a shadow of a doubt, this is where God has led me. I’m going to send you a couple of books to read that you might also find enlightening. Also visit catholicconvert.com you will meet a man who too was stunned to find himself led to the Catholic faith. He does an indepth study of scripture that led him to the church. I know you will greatly appreciate his work in this matter. St. Paul did NOT Write for Us! When arguments about salvation arise between Catholics and Protestants, the Bibles are usually opened to Galatians and Romans. Are we saved by faith alone or are works involved? Protestants quickly accuse Catholics of teaching a salvation based on works and Catholics quickly point out that Protestants have swung the pendulum too far in the other direction by refusing to accept human cooperation and obedience as necessary to the process. As final proof of their point, Protestants will quote Romans 3:28: “For we hold that a man is justified by faith apart from works of law.” That should end the argument right? Salvation is not by good works or obedience, but by faith alone? So, the combatants rush to the books of Galatians and Romans to solve this Catholic-Protestant disagreement. But there is a huge problem here. Paul did not write these letters to us and he knew nothing of the Catholic-Protestant debate. The huge problem we have is the problem of anachronism. The problem is that when Paul wrote these two letters he was not writing them to us today. He was writing to the Gentiles and Jews of the first century. He didn’t know about the Catholic–Protestant debate. He was not writing to Germans like Martin Luther or Americans like us. Paul was writing to people two thousand years ago living in places like Iconium, Pamphylia, Lystra, Galatia and Rome. They were not having a raging Protestant–Catholic debate. These good folks were having a Jewish–Gentile debate which was a whole world away. To read our current situation back into Asia Minor, Palestine, and Europe of the first century is a classic case of anachronism. They couldn’t have said it any clearer than in Acts 15:1: “Unless you are circumcised according to the custom of Moses, you cannot be saved.” They want to impose the “works of the Law” referred to above in Romans 3:28 upon the gentiles. It had nothing whatever to do with Catholics and good works. It has to with Gentiles coming into the Body of Christ by faith and obedience, not by becoming circumcised Jews. 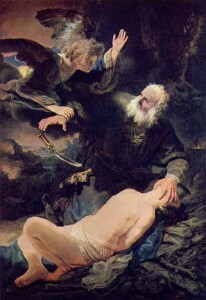 Abraham, the father of the Jews, was the prime example or case in point. Was he saved by circumcision and by obeying all the laws of Moses? Heavens no! He was saved while an uncircumcised pagan gentile living in Ur of the Chaldees, a thousand miles to east of Israel. Circumcision was only given as a sign of the covenant, not the means of salvation. And he did not obey the 613 laws of Moses since they would not even exist for another six hundred years or so. Abraham was saved by the grace of God and his belief and obedience and not by “the works of the Law” (See Romans 4 and James 2). This is exactly what Catholics teach! We are not anachronistic. We understand Galatians and Romans within their proper chronology. Paul wrote to that particular age and culture with its particular problems. We live in a different age and culture with different particular problems. 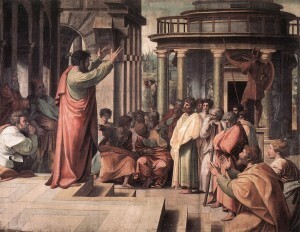 But, even though Paul didn’t specifically write his letters to us, if we study the cultural climate in which they were written, and stay faithful to the tradition in which they were passed on to us, the Holy Spirit (the primary author of the letters) will help us apply the principles and truth of those letters to our current situation.